Poultices are a staple in our homemade first aid supplies. 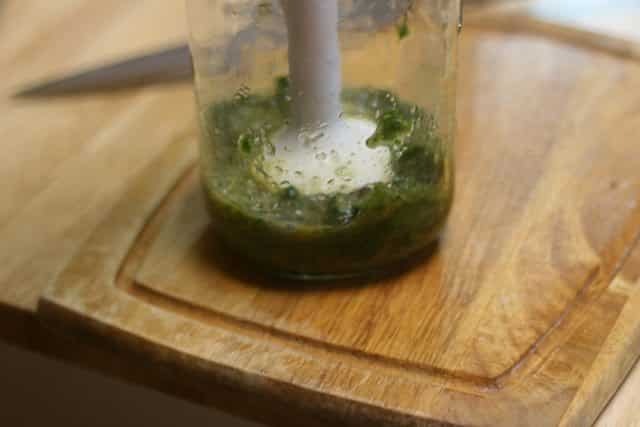 I like to keep a few homemade comfrey poultices on hand for when we need them and I’m going to show you how you can make them in advance too. A few years ago our oldest daughter bruised her big toe at dance (pointe ballet). She has no idea how it happened, it looked like someone dropped something heavy on it, the entire toenail was purple and blue. You know, the kind of hurt that when someone accidentally bumps it you start doing that silent cry that just won’t stop. Yep, that kind of hurt. We don’t normally treat bruises in our family, especially since they are usually from a bump or playing paintball. But this one was different than most bruises, so after reading up on bruises, I decided that we needed to try a comfrey poultice. Fortunately, I just happen to grow comfrey in our garden. So, I headed out to the garden and picked four comfrey leaves and then got to work. I knew that she would need to keep up the comfrey treatment for a few days but I didn’t want to make it each time she needed it. I decided I would make some small poultices and freeze them. Comfrey is best used fresh, but when it’s a choice between using frozen comfrey poultices regularly or using fresh comfrey poultices irregularly, the choice is easy. The convenience of frozen comfrey poultices outweighs the benefits of fresh comfrey poultices for me. To make a comfrey poultice for the freezer, you’ll need…. There’s a printable page at the bottom of the post that you can print out and put in your wellness notebook. The printable page has all the instructions and ingredients for making a comfrey poultice. Once you have the comfrey leaves, rinse them off under cool water. Roughly chop the leaves and put them in a wide mouth mason jar. Add enough water to just barely cover them and add a tsp of psyllium husks to thicken it up so that it doesn’t just slide all over the place. Used an immersion blender to blend it all up and make a paste. 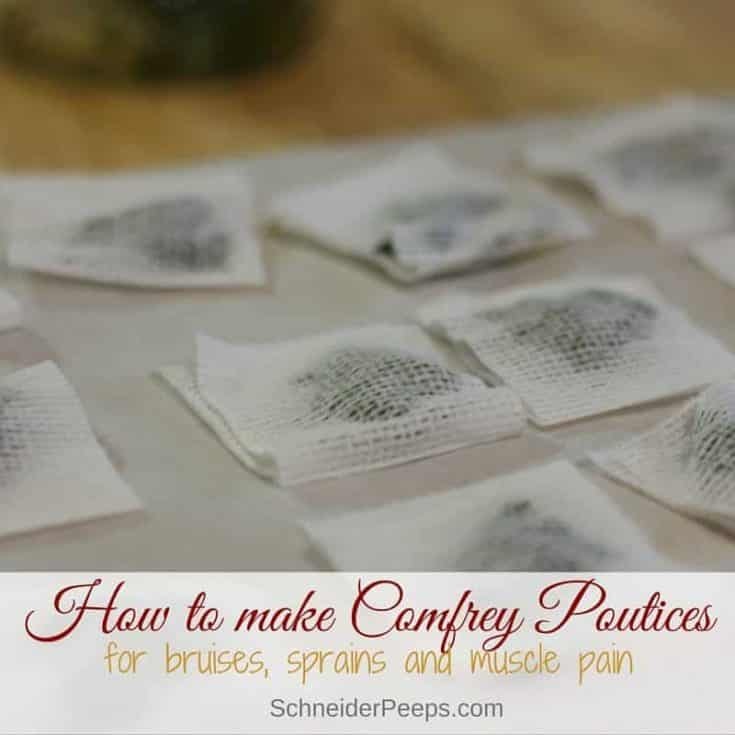 Open up some gauze pads and put a small spoonful of the comfrey poultice on each one. Once they were all full close them up and put them in the freezer for a couple of hours. When the comfrey poultices are frozen, put them in a freezer container and put them back in the freezer. When one is needed, we can just pull it out and let the body heat thaw it out. Whether you’re using a fresh comfrey poultice or a frozen one, once they’re made, you use them exactly the same. You’ll take the poultice and put it on the affected area – bruise, sprain, bee sting, etc. I like to cover the poultice with a waterproof gauze pad and tape it securely. If the affected area is on a wrist or ankle we usually just wrap the area with a roll of gauze instead of using tape. Change the poultice several times a day. Comfrey has been used for hundreds of years both internally and externally. However, it’s been found that comfrey can cause liver damage when used internally, so don’t take comfrey internally. That also means, don’t use comfrey on an open wound as it can more easily seep into your blood stream. I realize that there is some controversy over the studies that lead to the recommendation to not use comfrey internally. If you are comfortable using it internally, that’s your business. However, I choose to err on the side of caution, especially when there are other herbs that are safe and can be used for the same concerns that comfrey can be used for. Don’t use comfrey on small children. Their smaller bodies have a much harder time processing toxins than larger bodies. It’s best to only use comfrey for 4-6 weeks in one calendar year. It’s also best to also take some liver supporting herbs while using comfrey, like drinking moringa tea or adding moringa to smoothies. Other liver supporting herbs include valarian, dandelion, burdock root, lemon balm, milk thistle, turmeric, and yellow dock, be sure to do your research before taking medicinal amounts of any herb. Of course, I think the best place to get your comfrey is to grow it yourself, you can get quality root stock from Buy Comfrey. It’s a super fast growing plant but if you just can’t wait you can order it. If you’re interested in studying herbs in depth, I highly recommend the courses from The Herbal Academy. 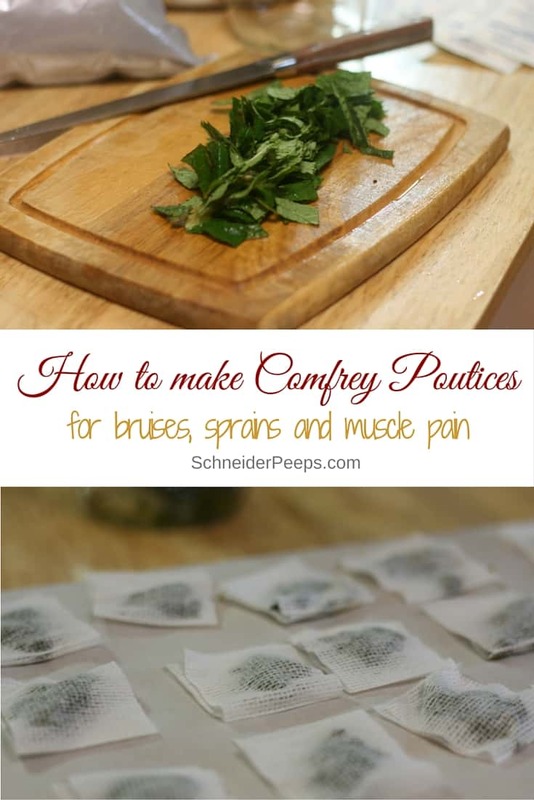 Comfrey poultices are great for sprains, bruises, insect bites, and many other inflammation issues. Add enough water to just barely cover them and add a tsp of psyllium husks to thicken it up so that it doesn't just slide all over the place. 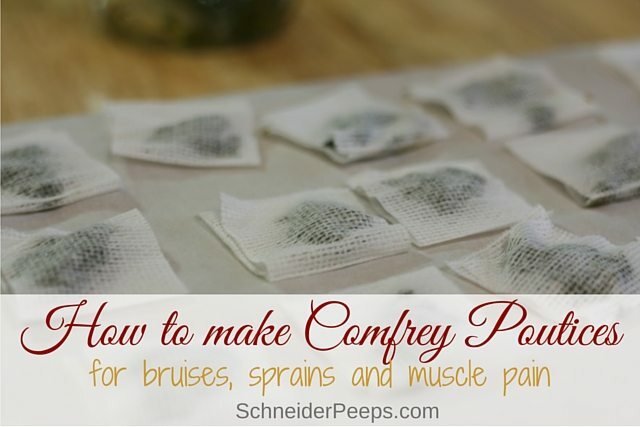 Put a frozen or slightly thawed comfrey poultice on the affected area - bruise, sprain, bee sting, etc. Cover the poultice with a waterproof gauze pad and tape it securely. If the affected area is on a wrist or ankle we usually just wrap the area with a roll of gauze instead of using tape. Tell me, do you use herbal poultices? If so, what do you use and for what? I’m excited to try growing comfrey again. My dear sweet ducks decimated the last crop of it I had. This time I might put a little fence around it to protect it. I love comfrey! 🙂 I grew some indoors in pots so that we had fresh even in the Winter. Very interesting. I’ll have to try this! No I have never used herbal poultices but haven’t wanted to learn how to. I have used comfrey poultices over a year ago. Sadly the frost killed my comfrey last year and the local herbal store didn’t have any in stock. The are so beneficial but also beautiful flowers. I also use Plantain poultices for the nasty mosquito bites we get. Lemon balm and lemon grass doesn’t deter these black and white ones. I was standing in lemon balm with crushed leaves rubbed on my skin and they were still biting my legs. Luckily my backyard is full of the useful plant. What a bummer about your comfrey. Plantain is such a wonderful herb, that’s really great that it’s all over your yard! My grandmother was an herbalist. She would grind up ginger root, put it in a cheesecloth bag, and soak it in rubbing alcohol until the extract was a dark gold. She would rub it on bruises. One day my two year old fell against a table and had a hige knot on her head. My grandma rubbed the extract on the spot, the swelling went down, and it NEVER BRUISED. True story! Not coming from a place that gets deep freezes I may have my info wrong – but I don’t think comfrey can be destroyed by a freeze. Most people who plant it, plant the special Blocking 14 type because it eliminates the *invasive* qualities of comfrey. A cut root will make more plants so you have to take care not to disturb the root system if you don’t want it to spread wildly but the flowers will not re-seed. The non-Blocking 14 type will reseed all over the place…..
My comfrey dies back to nothing every year in the winter but then comes up with a vengance in the early spring. Maybe yours will come back! No, I have not used herbal poultices. Sounds interesting. I loved to try it. I have not used it in years, but I’d love to grow some and start using it again. I’ve never used the term poultice. But we use to treat bee stings and cuts or scrapes with a poultice. I’m trying to remember what they used. Maybe it was plantain. My papaw liked to put chewing tobacco on sunburns. ha! My grandpa did too. So weird but apparently it worked. Plantain is great for bites and scrapes so it probably was that. I’ve seen people just chew it a bit and then stick on the sting to draw the toxin out. Plantain is great, isn’t it? We also use comfrey in the garden. I love multipurpose plants! I am just starting to study herbs so no I do not use poultices. yikes! You never know what will cause a reaction in people. I’m glad it was just itchy skin. The hairs of the leaves can be irritating. Yes! They’re very fuzzy and could easily agitate delicate (wounded) skin! What happens if you ingest comfy? It’s really hard on the liver. Some herbalist will still recommend ingestion but only under strict guidelines. I don’t have near enough training to ever recommend ingestion at this point in my studies. I haven’t used an herbal poultice on people, but have used soothing chamomile tea bags on a horse’s swollen eye (insect bite). My grandma made poultices when I was a child and I thought it was some kind of magic. Now I make them for ear aches, black eyes, scraped knees, bruises, pulled muscles, sore necks, clogged sinuses, ingrown toenails, rashes, and just about anything a family with two kids and a husband that’re always into something and needing me to tend their wounds. And despite the numerous times my methods have worked they always look at it a little skeptically at first, then pure amazement takes over. It’s both annoying and hysterically funny, and leaves me proud of my work, for a minute anyway? lol…my family does the same thing. One of our son’s is in school in NYC and during our skype call last week he said, “By the way, this elderberry stuff really works. Everyone is getting the flu but me. I feel like I have my own secret potion.” I counted that a win! I have not use poultices for anything yet, but am excited to learn more. Comfrey is on my list of new things to add to my garden! We have used comfrey and yarrow for lots of issues. Natural plants for healing work so much better than synthetic meds. I’m very interested in learning to use poultices and balms. My Great Grandmother was Cherokee and made all kinds of poultices and salves, etc, but I was too young to know to write them down. Wish I had! Never used a poltice before or confrey! Hope I win!! I’ve taken a Family herbalist course, too, but have not used comfrey yet. I did find at least 10 medicinal and/or edible herbs growing in my garden that I thought were weeds. I especially like plantain which was growing abundantly and I was able to use it right away on my grandsons bee stings. That’s wonderful! I bet you were so excited to find those treasures. I’ve never grown comfrey before, but I’d love to try it. Thanks for the chance to win. Oh, I forgot to comment that I have never used herbal poultices before, but I’m very interested in herbal medicine and would love to get started with the comfrey. I hope to try making a poultice with the comfrey! I have never made or used these But I do make salves can’t wait to try this. I haven’t used herbal poltices in years ,I use to use mustard politice for pain but really looking forward to using herbal medicine again .I am learning more everyday and cant wait to plant a herb garden this spring.Thank you for the chance to win this. I have mainly used plantain and yarrow as a poultice, but I know that comfrey works very well, too! It’s one of my very favorite plants. Thanks for the giveaway! I have not used a poultice before but really want to start. I think I will start with comfrey this year. I’ve never tried a poultice, but have recently started an herbalism class and look forward to trying this. I grow most herbs…but comfrey I do not have as yet! Plus I’ve never thought of making a poultice…and I don’t know why! Thanks for the info and the chance! I have been reading alot about them, but have not used any yet. Comfrey would be a great stating point! I haven’t used a comfrey politics in years, but I hope to start growing my own herbs again, now that we’ve settled down again. I remember using one for a sprained ankle, it was amazing. This is something I have never done, but want to learn more about. Have wanted to grow Comfrey, but I heard it can not be grown from seed? The kind that can be grown from seed is very invasive, so you’ll probably want to stay away from that one. Russian Bocking 14 has sterile seeds and is grown from rootstock. Comfrey is one herb I’ve not tried yet in my home remedies. I’d love to get some to grow and begin using. Thanks for the how-to post. I have only used one …. on a sprained ankle….. but I thought it was great! I have used both mustard plasters and turmeric poultices. I would love to use comfrey also! Can the poultice be made with dried comfrey? I have some on hand…thank you! Yes, it can. Thanks for asking. You can get a comfrey plant at your local nursery. I used comfrey poultices for child birthing mothers, if they tore, or were badly bruised. scare of using comfrey internally, was somewhat refuted years ago. Safe used in moderation. wrapping overnight. Next day, I was out and about, without crutches. Love knitbone! Thanks for sharing your experience, Noel. I appreciate you point of view. Because I’m not a certified herbalist or health care practitioner, I feel it’s prudent for me to give generally accepted warnings about herbs. Of course, people need to do their own research and do what’s best for their families. We love comfrey too, it’s such a great herb. If you really research comfrey you will see the so called dangerous alkaloids are only found in the new leaves, not the mature ones. It has been ingested for hundreds of years. Hi JJ, I realize that. 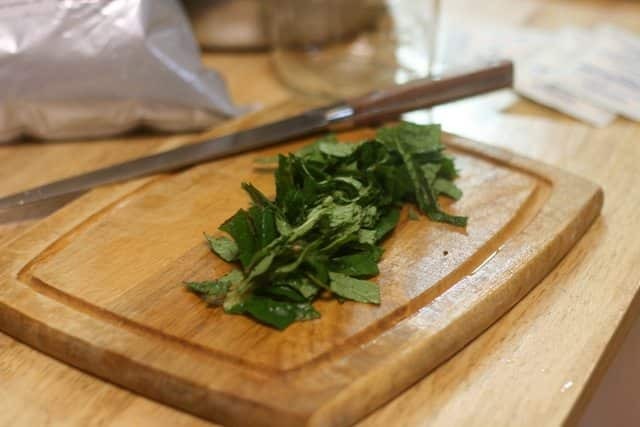 However, there are herbal things I’m comfortable doing with my family based on my research, that I’m not comfortable recommending that others do without the help of a knowledgeable herbalist – ingesting comfrey is one of those things. Thanks for your input. I have one question, I have a CAM with specialty in Medicinal Herbs. IF comfrey has info the can cause Liver damage and you recommend not ingesting it or even putting it on a open wound ; Why put it on Skin it will absorb and get into blood steam anyway ? Hi Mary, I appreciate your question and if you are comfortable using and recommending comfrey to be used on open wounds and internally in your practice, than by all means continue to do so. 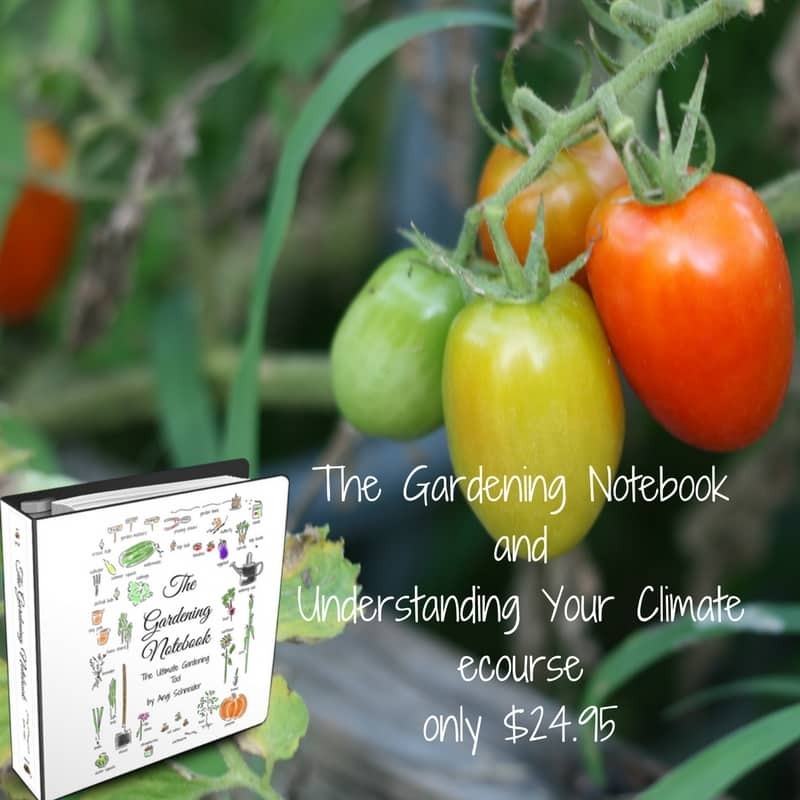 The vast majority of readers of my site do not have the level of herbal training that you do so whenever I share about herbs that have questionable toxicity I err on the side of caution. 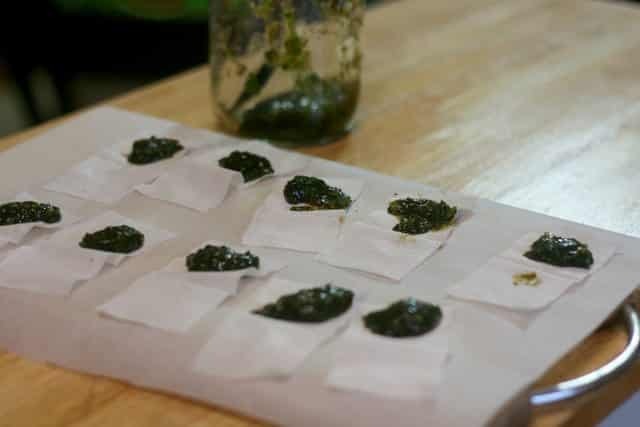 There is a difference between ingesting an herb and using a herbal poultice as far as amounts of chemical compounds that will get into our blood stream and come in contact with our liver. I hope you noticed that I still recommend liver supporting herbs when using comfrey as a poultice because as you state, some of the compounds will be absorbed into the blood stream. 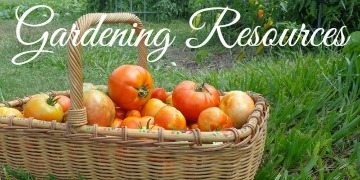 I realize that this is a hot topic among herbalist and I certainly don’t want to add fuel to the fire, however, I also don’t want to lead those who come across this one article on making a comfrey poultice to misuse or overuse comfrey and cause damage to their body because I neglected to list common safty precautions. 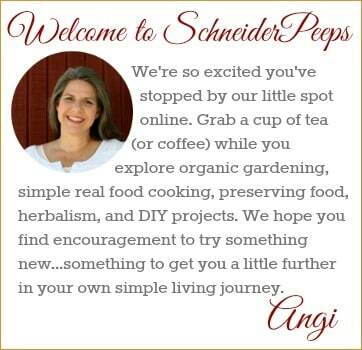 Writing online is different than having a private conversation or consultation with someone. I hope this answers your question. Comfrey can be used in the garden, good for compost bins, and for putting in the bottom of hanging baskets, pot plants, and yes havest the older leaves, looks nice when in flower. Thanks for the tips, Joy. I hadn’t thought of using it in the bottom of potted and hanging plants.